Prebook your spot on our scenic Sightseeing Lunch Cruise and enjoy one of the unique ways to see Manhattan! Enjoy an afternoon of dining, dancing and incredible views as you cruise along the Hudson River. 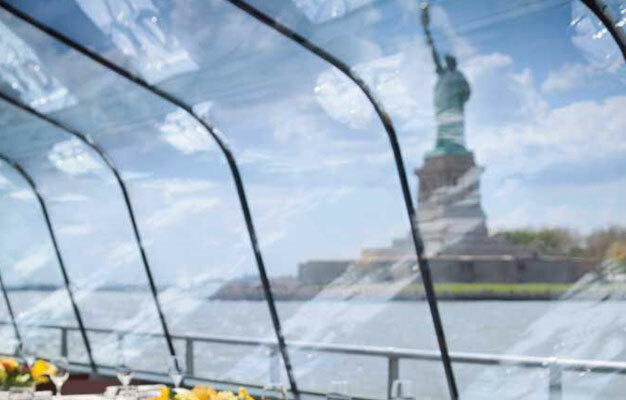 Your cruise departs from Chelsea Piers in New York City, following a route that includes well-known landmarks like the Freedom Tower, the Statue of Liberty and Ellis Island. See the majestic New York City skyline and get up-close views of the iconic Manhattan and Brooklyn Bridges. Enjoy incredible views from inside the glass-enclosed ship or head out to the open-air observation area. Meanwhile, our pianist will entertain you with music and interesting facts about New York’s notable sights as we cruise by. Piano melodies are the perfect complement to a leisurely three-course lunch, filled with flavorful selections prepared by our chef. Enjoy attentive and friendly service for your party while you savor creative appetizers, entrées and desserts. The cruise starts at Chelsea Piers - Pier 61. The address will be on your e-ticket. Please be there 30 minutes before the tour starts. The cruise ends back at Chelsea Piers. The cruise lasts approx. 2 hours. The dress code for the lunch cruise is dressy and smart. No casual jeans, t-shirts, shorts, or flip-flops please. Mondays, Fridays and Saturdays: Boards at 11:30 AM, Sailing 12 PM-2 PM. Wednesdays: Boards at 11 AM, Sailing 11:30 AM-1:30 PM.